This fabulous apartment is set in a brand new complex within easy walking distance of all the bars, restaurants and shops. 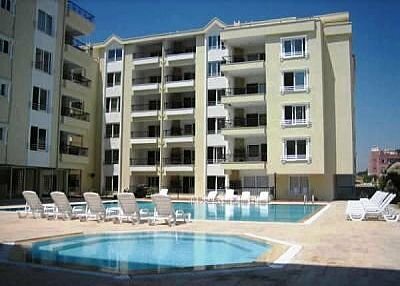 This apartment is the complete package for any party looking to enjoy all that this spectacular part of Turkey has to offer. The apartment is furnished perfectly for holiday lets. It is bright and spacious and comfortably accommodates 6 people. Altinkum remains a fundamentally Turkish resort. The long sweeping promenade comes alive every night with live Turkish music, theatrical ice cream vendors, belly and break dancers. Large family parties spanning generations stroll up and down the main promenade, adding to the sights, sounds and smells of this bustling sea front resort. Didim runs a local market every Saturday the local dolmus will take you there, they run every 5-10 minutes and is well worth a visit. The main shopping centre is in Dolphin Square, and the shops are open till late. Here you will pick up your usual souvenirs, find good value leather goods, and if jewellery is what you are looking for the quality of the gold is excellent and much cheaper than at home. The Temple of Apollo is the main historical attraction for Didim and Altinkum. Within striking distance you also have the ruins of Miletos and Priene. Less than two hours away is Ephesus, Turkey’s primary tourist attraction and one of the most remarkable examples of ancient civilisation. A trip taking in Ephesus, the Virgin Mary’s house, and the local town of Selcuk and its castle makes for an ideal day out.. Containing a staggering wealth of historic sites, Turkeys inexpensive Aegean makes a marvellous introduction to both ancient and modern Turkey. Buses make easy connections between sites. Picturesque Bodrum boasts hopping nightlife, a crusader castle and the tomb of King Mausolus. The rest of the coast has Roman ruins and Byzantine remains aplenty, including Troys walls, as well as the monument-strewn WWII battlefields of Gallipoli, the resort town of Kusadasi, fabulous surfing beaches and modern Izmir.